Local leaders of the anti-slavery movement are doing a lot and getting much accomplished thanks to your support, thoughts, volunteerism, signatures and prayers. To move forward, we need more people to take up a more active role. That's why we are revealing our new plan of Lay Groups. 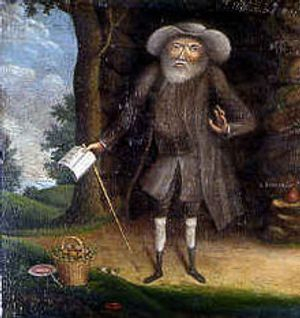 The name comes from Benjamin Lay (pictured above), one of the earliest and most zealous opponents of slavery. Lay made several dramatic demonstrations against the practice. He once stood outside a Quaker meeting in winter with no coat and at least one foot bare and in the snow. When passersby said expressed concern for his health, he said that slaves were made to work outdoors in winter dressed as he was. On another occasion, he kidnapped the child of slaveholders temporarily, to show them how Africans felt when their relatives were sold overseas. Although, we won't be kidnapping anyone or doing any other illegal activities, Lay Groups will do everything we can to raise awareness of human trafficking as long as it doesn't further exploit people. Lay groups will be responsible for leading the charge against slavery in their religious body. Lay was fueled by his religious beliefs. Likewise, we want each religious body to have a Lay group that will keep the issue of human trafficking an important issue to their place of worship. Each Lay group will be asked publicize area anti-trafficking events and to spread awareness during special occasions like the National Human Trafficking Awareness Month (January) and take part in Shine a Light on Slavery Day (February 27thish). Leaders of each Lay group will also meet once every 3 months to go over ideas, events and pray for their work. Church Lay Groups can consist of 1-4 persons. If you'd like to start a Lay Group in your place of worship, let us know!